Panti Bliss for St. Patrick's Day parade? It's looking "unlikely"
Orgainsers have said that the process to select the Grand Marshal is “well underway and has started a while back”. 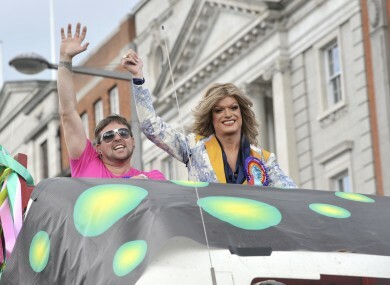 Panti (right) at the Dublin Pride Parade in 2010. A CAMPAIGN TO make Panti Bliss the Grand Marshal at this year’s St. Patrick’s Day parade in Dublin looks unlikely to succeed. Organisers have said that the process to select who leads the parade “is well underway and this year’s Grand Marshal will be unveiled closer to the festival”. A spokesperson for St. Patrick’s Festival said that “at this point it is unlikely” that Panti Bliss will follow Nicky Byrne, Katie Taylor, Johnny Giles, Ronnie Drew as the Grand Marshal of the Dublin parade. The orgainsers say that although the process of choosing the Grand Marshal doesn’t take long, the board is required to meet on the matter. The campaign to make Panti Bliss the Grand marshal of the parade is being spearheaded by LGBT rights activist Buzz O’Neil who has set up a Facebook page to spread the word. As of this morning the page has been liked almost 2,500 times and invites people to contact the St. Patrick’s Day Festival organisers to make it happen. “Ireland is finally having a widespread conversation about gay life in modern Ireland, and more importantly about homophobia and all that encompasses,” said O’Neill. O’Neill has accepted that it may be too late for the campaign to succeed but is not giving up completely. “While we fully understand that the decision to name the 2014 Grand Marshall has more than likely happened by the board of the St. Patricks Festival, we would like to see Panti included in the festivities somehow,” he said. The campaign has been given extra poignancy by a row in New York over that city’s upcoming St. Patrick’s day parade. The city’s new Mayor Bill De Blaiso has said that he will boycott the march after organisers said they would not be allowing pro-gay rights expressions during the march. Both Taoiseach Enda Kenny and Tánaiste Eamon Gilmore said yesterday that they intended to take part in the spectacle that usually draws up to a million people but there have been several calls for them to follow De Blaiso in boycotting it. John Lyons TD, who yesterday outlined to the Dáil some of the homophobia he has suffered, told Ryan Tubridy on RTÉ Radio that their attendance would be wrong given the context of the current debate taking place in Ireland. I think there’d be more credibility to the Irish people by the Government if they took that stance. Especially where we are right now and the type of debate we’ve been having. It almost contradicts with what myself and Jerry and some others stood up and talked about. Brian Sheehan, Director of GLEN (Gay and Lesbian Equality Network) has also asked the Irish government not to take part in the New York St Patrick’s Day Parade. Email “Panti Bliss for St. Patrick's Day parade? It's looking "unlikely"”. Feedback on “Panti Bliss for St. Patrick's Day parade? It's looking "unlikely"”.